Difference between revisions of "Wire EMF Databinding RCP"
<li><code>PersonImpl#setSurname(String)</code>: There's more code you thought you find in this method, right? 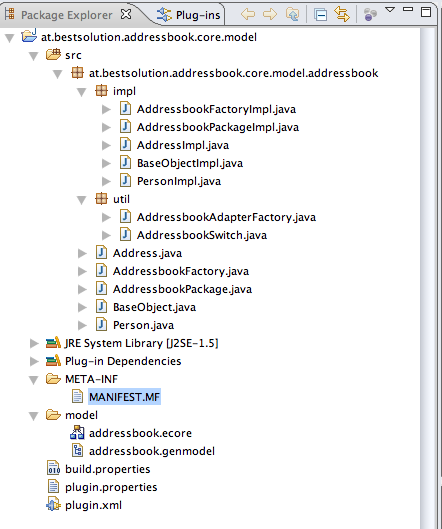 This is a problem because the Databinding-Framework shiped with Eclipse 3.3 can only deal with JavaBeans and not with EMF-Objects (Work is done by the EMF-Group to overcome this limitation in [https://bugs.eclipse.org/bugs/show_bug.cgi?id=75625 Bug 75625]). The translation between the EMFs ChangeNotification-System and the standard PropertyChangeSupport is a task we are going to solve later. A big advantage of EMF generated code is that you can't forget about the notification code like it happened when you handcrafted your model-classes which was boring task. <li><code>PersonImpl#setPrimaryAddress(Address)</code>: Once more you'll find out that there's more code. What you might have expected to find is the code in <code>basicSetPrimaryAddress</code>. The reason why <code>setPrimaryAddress</code> holds more code is that we modeled <code>Person#primaryAddress</code> and <code>Address#person</code> as <code>EOpposite</code> in our ecore model. Which means that when ever we set <code>Person#primaryAddress</code> <code>Address#person</code> has to be synced (and the other way round). Once more you would have done the same your own when you handcrafted model classes in former days but there was a great likelyhood that you made a mistake which was very hard to track down. 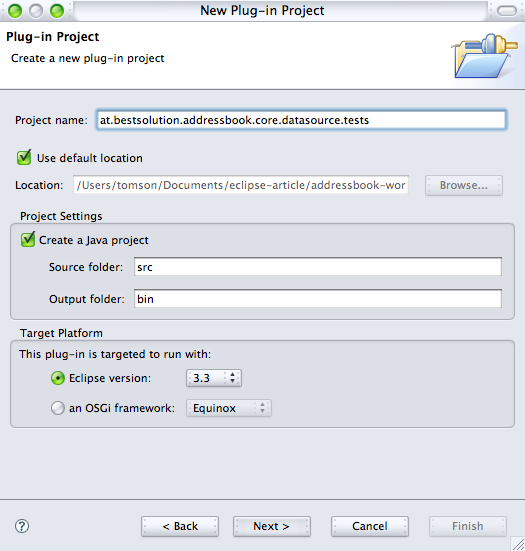 I'm trying to implement a fairly simple address book application on top of RCP using frameworks provided by Eclipse in 3.3. There's also focus on how to structure and design an RCP to be as extensible and as flexible as possible, including theming, internationalization, datastorage independency, ... . This article is going to introduce you to some basic concepts but it will not provide a full featured introduction to every thing EMF, OSGi and RCP are providing. E.g. this example will not implement dynamic contributions who can get loaded/unloaded at runtime, it will not use the advanced EditingDomain and Undo/Redo features provide by EMF. Since 3.4 there also a provisional EMF-Databinding intetgration available still this article is based on the offically available plugins nonetheless people having finished this tutorial should not have a problem to write applications with the EMF-Databinding plug-ins. At the beginning of every project is the package design or in RCP/OSGI Environment this breaks down to the design of the various plugins and their responsibilities. One of most important things when it comes to plugin design is to split all your plugins into UI and non-UI (with the business logic) parts. This makes automated testing of the business logic using JUnit tests easier. This plugin provides the UI bits (ViewPart, ...) for the addressbook application. This plugin addresses the themeability of the application by providing a pluggable theme-API. It will by default provide a standard theme. 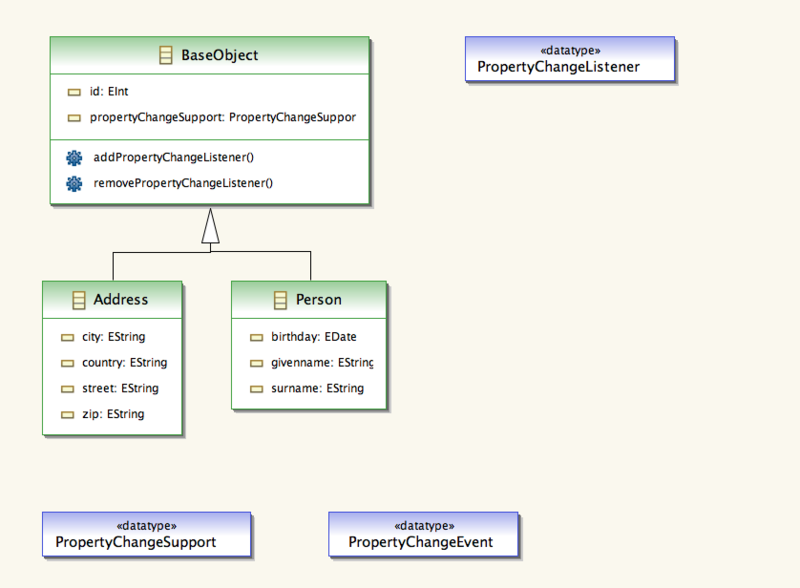 The domain model is fairly simple and can be represented by 2 classes as shown in the diagram below. 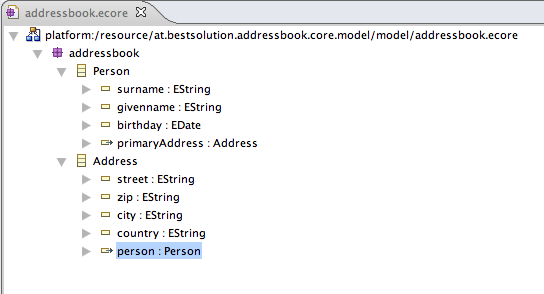 The only interesting thing is that there's a bidirectional relationship between Person(Attribute: primaryAddress) and Address(Attribute: person). 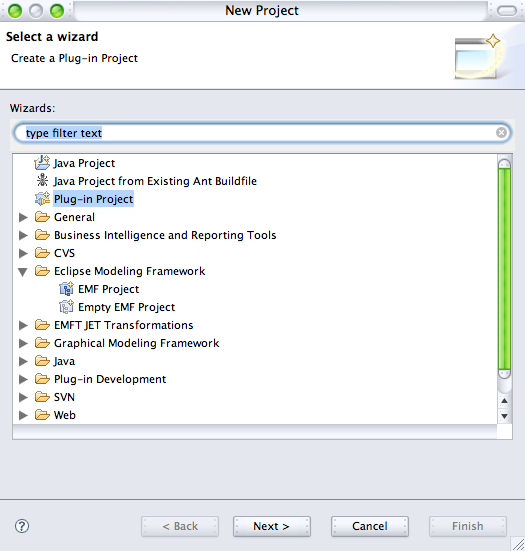 Open the "New Project Wizard"
Right click on the addressbook-package you have created above and select "New Child > EClass"
Right click the Person and select "New Child > EAttribute"
Right click the Address and select "New Child > EAttribute"
You'll notice that the types used for the attributes are not the standard classes provided by the JDK but wrappers defined by EMF. EMF provides wrappers for the most import JDK classes. EMF holds META-Informations about your model and that's why all classes part of an Ecore-model have to be known to EMF. Those META-Informations are used by EMF to do fancy things but can also be of use for you when you want to get informations about an your model (or the model of someone different). EAttribute: This represents an Attribute in EMF terminology TODO more information about EAttribute You'll notice that the types used for the attributes are not the standard classes provided by the JDK but wrappers defined by EMF. 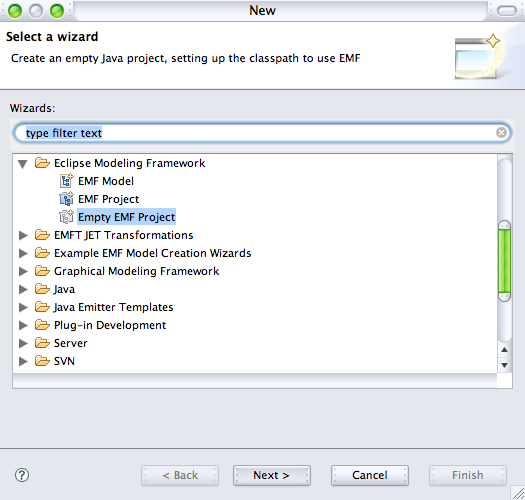 EMF provides wrappers for the most import JDK classes and want to use another classes coming from the JDK you'll have to add an EData Type to your Ecore-model. We'll see this later on. Right click the Person and select "New Child > EReference"
Right click the Address and select "New Child > EReference"
Right click on the addressbook-package you have created above and select "New Child > EData Type"
Instead of writing the Java-Model-Objects our own we use EMFs codegeneration features do this boring task for us. 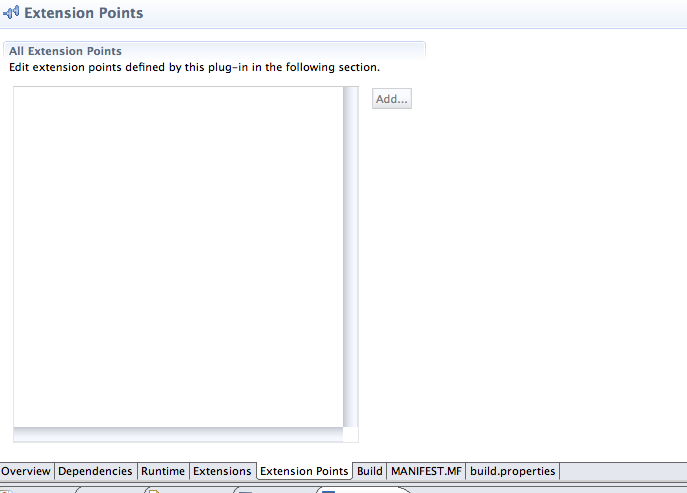 EMF creates Stub-Objects for us which we are going to customize and implement the stub methods. Click Next until you reach this window where you press "Load"
Click "Next" and afterwards "Finish"
We have no created a so called genmodel which gives us control over how EMF generates Java-Code. E.g. we could define to use Java5 generics, ... . We will make some minor changes like e.g. the name of the base package and suppressing of EMF Types in our public API. 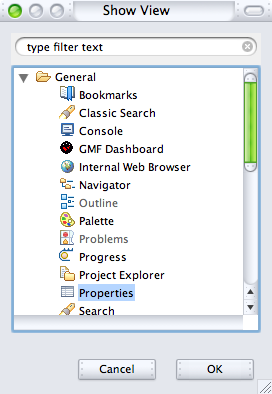 Scroll in "Properties View" to the section "Model Feature Defaults"
Change the "Base Package" to "at.bestsolution.addressbook.core.model"
at.bestsolution.addressbook.core.model.addressbook.impl: This package holds the implemenation for all interfaces from the afore mentionned package. 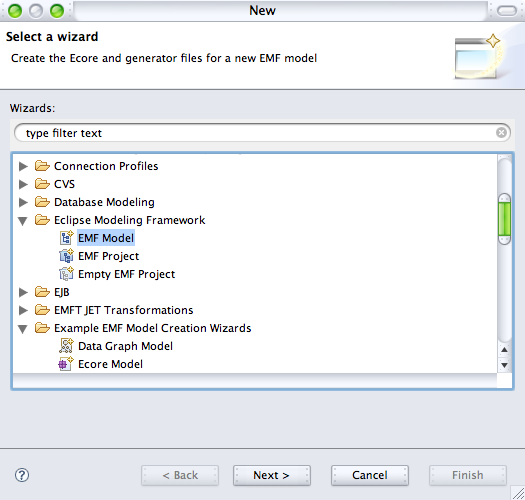 You might have noticed that EMF has create 2 more classes we haven't defined in our ecore-Model. Theses classes are useful if you want to use find out informations about your model or interact with it e.g. creating instances of your interfaces. 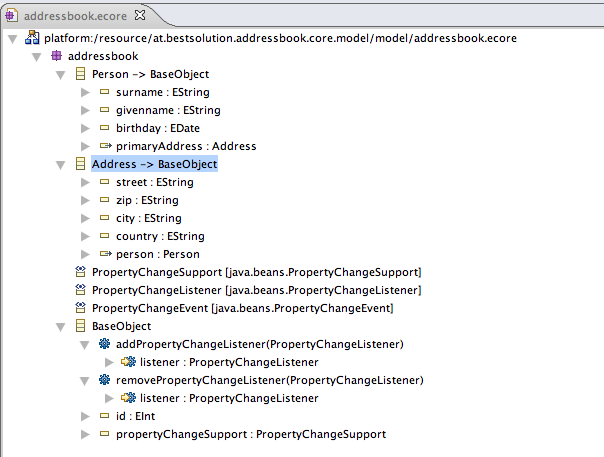 AddressbookFactory: Provides methods to instantiate your model classes.TODO More informations? AddressbookPackage: Provides informations about the whole package (Informations about all classes, attributes, methods, ...). TODO More informations? Having done this nobody from the outside can access the real implemention classes any more but has to work with their interface representation. Because the real implementations are not visible any more to the consumer of our plugin he/she won't be able to create instances of them directly but instead has to use our AddressbookFactory. All Elements generated by EMF have an @generated in their JavaDoc. If you customize a method you need to remove this @generated else your modifications are overwritten the next time you generate your model code. This is a problem because the Databinding-Framework shiped with Eclipse 3.3 can only deal with JavaBeans and not with EMF-Objects (Work is done by the EMF-Group to overcome this limitation in Bug 75625). The translation between the EMFs ChangeNotification-System and the standard PropertyChangeSupport is a task we are going to solve later. A big advantage of EMF generated code is that you can't forget about the notification code like it happened when you handcrafted your model-classes which was boring task. PersonImpl#setPrimaryAddress(Address): Once more you'll find out that there's more code. What you might have expected to find is the code in basicSetPrimaryAddress. The reason why setPrimaryAddress holds more code is that we modeled Person#primaryAddress and Address#person as EOpposite in our ecore model. Which means that when ever we set Person#primaryAddress Address#person has to be synced (and the other way round). Once more you would have done the same your own when you handcrafted model classes in former days but there was a great likelyhood that you made a mistake which was very hard to track down. Right click on the Addressbook and select "Generate Test Code"
As you see we are following the TestDrivenDevelopment idea which means that we are writing the TestCase before we implement the methods so the tests are supposed to fail at the moment. We'll implement the methods in next section. As you have seen above EMF uses a different system for change-tracking and notification of interested parties. Before we can start to think about how to translate form EMF-Notification-System to PropertyChangeSupport we need to find out how the EMF-System works. You see that that the information passed by EMF holds all necessary informations about the change and to get one of parties who is informed about a change we need to register as a so called org.eclipse.emf.common.notify.Adapter. Run the JUnit-Test case for BaseObjectImpl. All tests should succeed else please check if you code looks like the one presented above. In this chapter we learned step by step how to transform our UML model into real java-code using EMF and its source generating possibilities. We wrote a JUnit-Test to test the bits we implemented our own (from the rest we expect EMF is doing the correct thing e.g. automatic updating of parent-child relationships). EMF has much more to offer than simply creation of code and some of those possibilities we are going to explore late on. Uncheck "This plug-in will make contributions to the UI"
In the above we created a so called "Extension Point" definition which allows others to contribute implementations and extend the functionality of the application. A possibile use case could be to add an implementation for a completely different datastorage system (e.g. one might use an LDAP-Server as the storage system). The advantage of extension points against programmatic contributions is the fact that the contributed bundle is only loaded (in OSGI terminology activated) when a class is accessed and not when the application is started. The following UML diagram shows you all needed classes. We create our own specialized exception which wrapping the orginal exception thrown by the datasource. This gives us the possibility to add features later on if we want (e.g. passing an Error-Code, a serverity, ... ). This is the abstract definition of the datasource implementation. 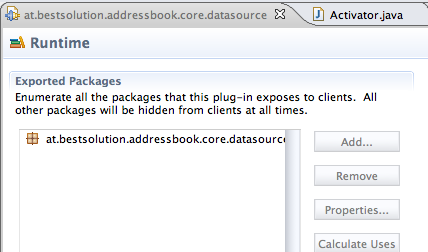 Concrete implementations are contributed using the "datasource" extension point we just declared above. 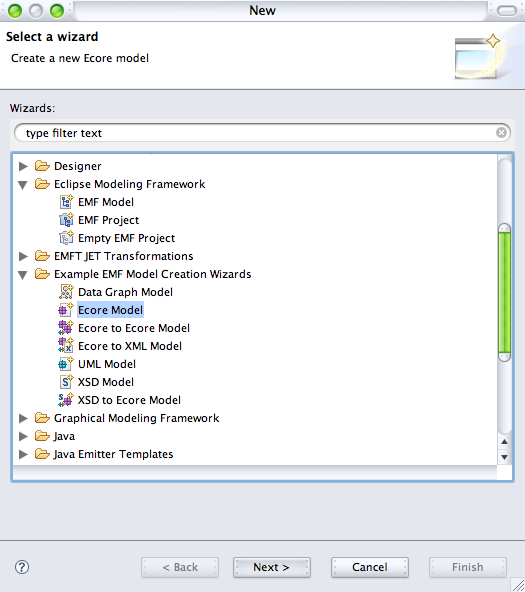 You might have asked yourself when we create the plugin why we added the org.eclipse.emf.ecore.change plugin now you know why we need it. This class is responsible to hold the informations provided by the "datasource" extension point. 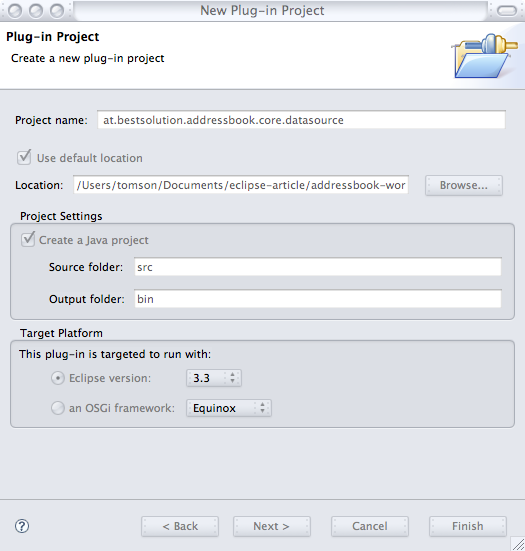 This information is provided the org.eclipse.core.runtime.IConfigurationElement-Instance. You'll notice that the above creates the datasource instance lazily this has the advantage that the plugin is only activated on demand and significantly improves startup performance. A general advice: Whenever possible you should load bundles only on demand and not by default. The job of this class is to manage all datasource implementations contributed and providing access to them. 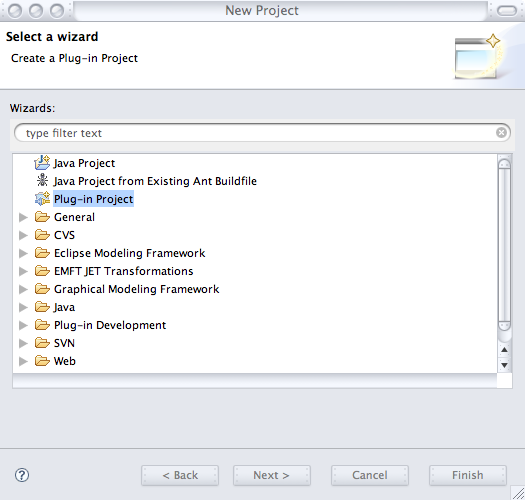 This class is generated automatically by PDE when the plugin is created. It is instantiated the first time a class from this bundle is loaded and afterwards the BundleActivator#start(BundleContext) is called. Currently this class is part of the public API of our plugin but this doesn't make much sense because nobody from the outside should access this class. 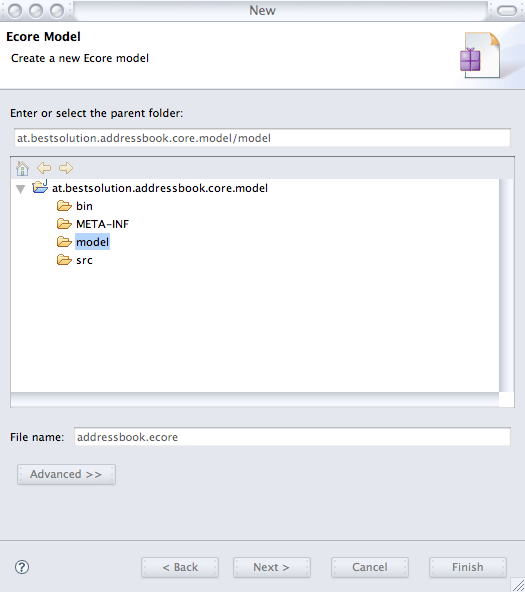 Let's create a new package named at.bestsolution.addressbook.core.datasource.internal and move the class there because the internal package is not part of the exported ones nobody from the outside can access this class. 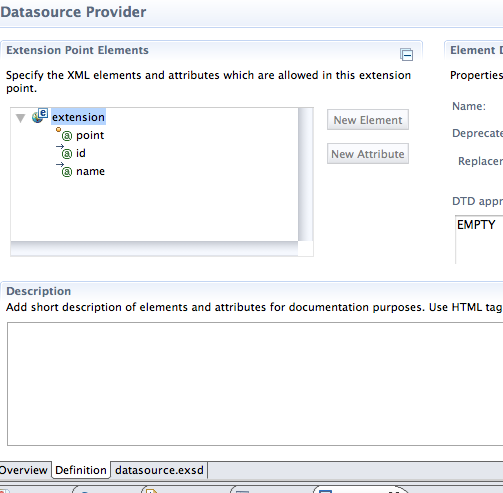 Because ChangeDescription is part of our API all plugins who make use of our Datasource-API need to import the org.eclipse.emf.ecore.change-plugin and to make this more comfortable we can also tell this plugin to reexport this dependency this way all plugins importing this plugin will automatically import org.eclipse.emf.ecore.change. As we did before we are writing plain JUnit-Testcases. Another possibility which is build above JUnit would be to use TPTP which is really cool project but has the big shortcoming that it doesn't work on OS-X until they solved this Bug and because we'd like to stay as cross-platform as possible this is not a possibility for us which is a sad thing because TPTP provide so many cool features. This is the class we are going to contribute using the extension point. 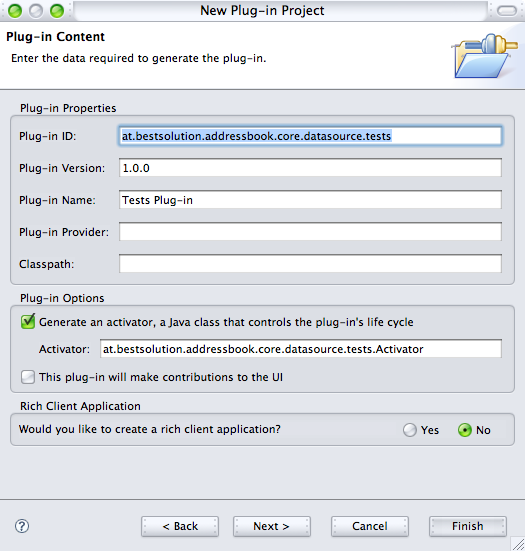 Right click on "at.bestsolution.addressbook.core.datasource.datasource" and select "datasource"
This class implements tests for the API provided by DatasourceManager. This class implements test for the API provided by DatasourceDescriptor. In the end we combine the 2 test classes into a TesSuite. The only important thing is that we add a public static Test suite() method which is needed to run the suite as a "JUnit Plug-in Test". Running the JUnit-Tests is trickier than a simple JUnit-Test because to take the extension point mechanism we are using to contribute our DummyDatasources the whole TestSuite has to run as an OSGI (or better Equinox) application. Nonetheless it's not fairly though to make this work because PDE provides the possibility to run the Suite in plugin-mode. The only thing is that the TestSuite-class has to have a method named: suite(). Running the suite we'll see all Tests are failing. So the logical next step is to fix the tests step by step. The manager is implemented as a Singleton so the implementation should be fairly straight forward for you. 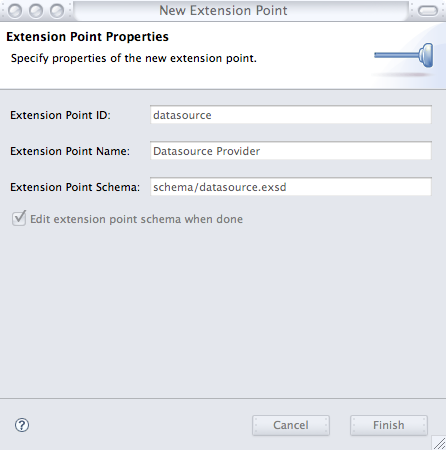 Here we see how we get access to the datasources contributed to us using our well defined extension point. In the end we ensure that noone from external can programmatically add a datasources by modifing the returned collection by create an unmodifiable one which is good programming praxis. Because DatasourceDescriptor#getInstance() is only package-scoped the only possibility to get access to a datasource is to call this method. Running the TestSuite you should see all tests succeeding else go back and see what is causing the problems. 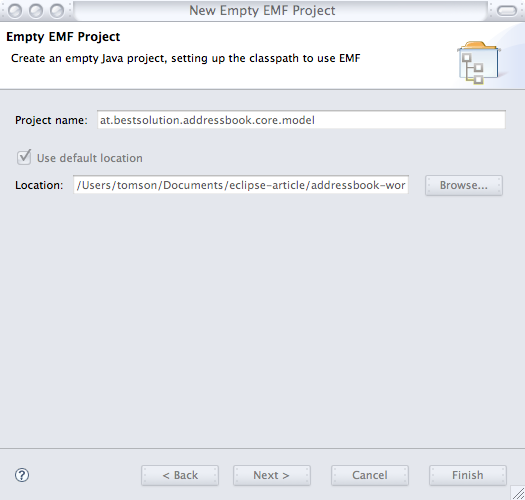 In this chapter we learned how to make our application extensible by the using Eclipse Extension Point mechanism. The PDE-Tools help us to easily create the extension point definition and along the way we also got to know more EMF classes which are of use for us (more in depth info will be provided as we proceed). In case the code you have is not working you can proceed by fetching it from SVN-Freeze_02. 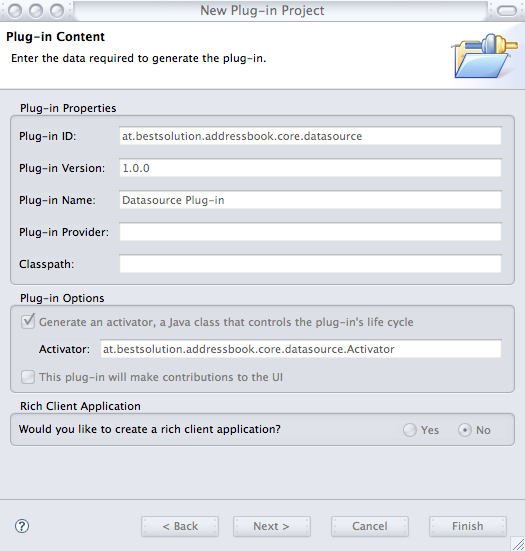 Before we proceed with the implementation let's as a first action ensure that nobody can't easily access the classes from our at.bestsolution.addressbook.core.datasource.xmi-plugin. We are using a special feature of the OSGi-Framework which allows us to make packages visible only the plugins we control. In our case this is the test-plugin which will have access to all classes of the internal package others won't be able to access them.